Well time has crept upon me and it's now afternoon! Not sure where the morning went though I know I slept more than I should have. I failed to set the alarm you see. So woke in a panic at 7.50 am. We usually get up at 7.20 am so it was a huge rush this morning to get Keagan out of the door on time. I know he is nearly 16 but he definitely ticks the teenage box where sleep is involved. We both hate to rush and prefer to sit down and have some brekkie and have a chat before he goes off to school. I'm in full on invite making mode so my Ebosser is ready for action. You can see some of the stuff I store under the desk including my birthday cards from May. Still want to read through them and keep some, recycle others, you know how it goes. 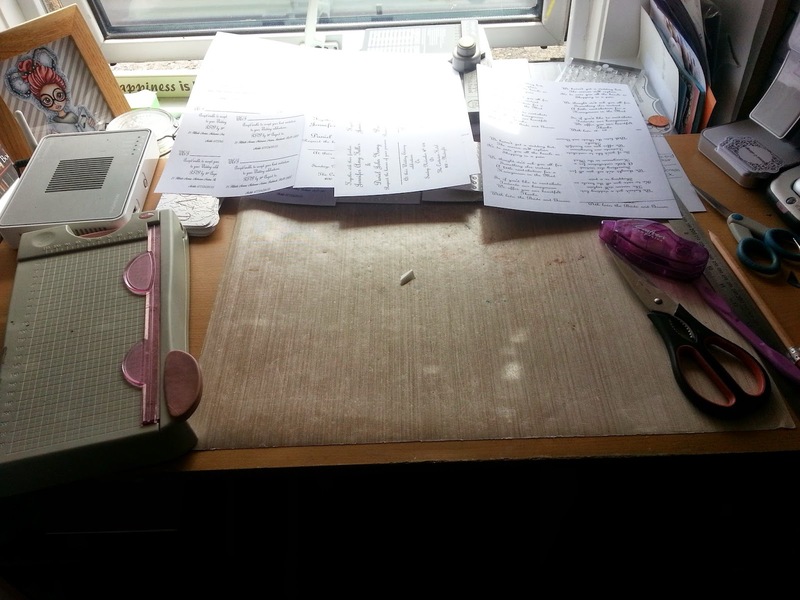 So window side is where the action happens I have space to work and there are 3 piles of printed page. All for those invites. There's a poem, RSVP and main invite. 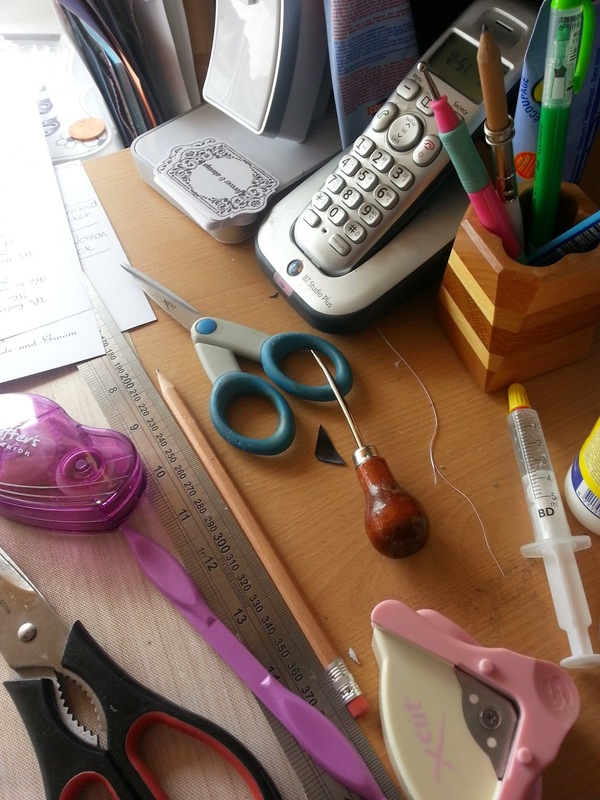 Some of the tools I use and yes on the base of my lamp are the stamped plaques that go on the front of the invites. Won't be long before I can share the actual invites with you all. The Day versions are complete and are with the bride-to-be I'm now working through the Evening version which is pretty much the same apart from some wording and colour change! Right pop over to our desk dashing Queen, Julia's place, to join in, find out or just be nosey! So many great photos... good luck with all the invitations! Love your array of pens, btw! 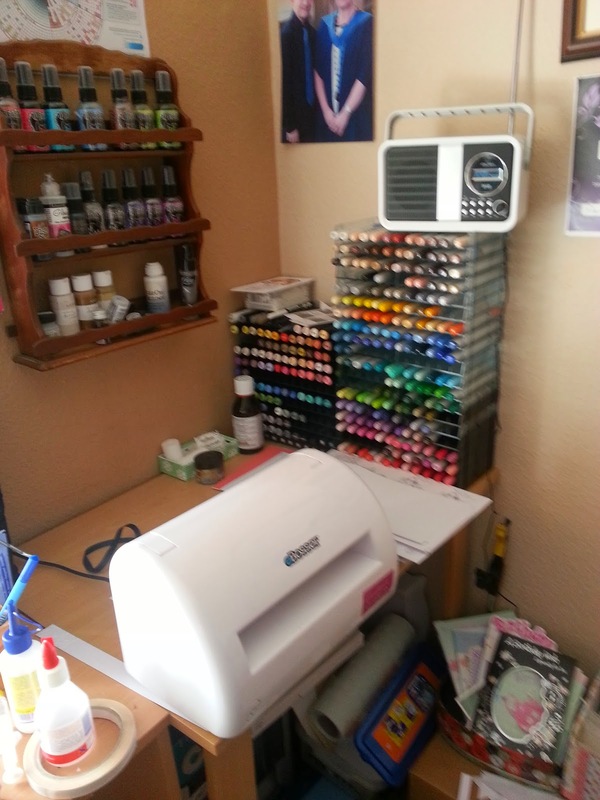 A fabulous organized work space she says as she looks around the disater called studio. i do not have any OC in my makeup so I am always impressed by tidy people and hope it rubs off. I hate being late..it doesn't often go well for me if I have to rush in the morning! You're working really hard. Hope you're enjoying the experience. I must say that faced with large multiples of the same thing now just makes me...yawn. Mind you, I've been doing enough of that already!! Looking forward to seeing the finished invitations. Looks like a nicely organised set up you have there. I hate rushing in the morning too, it's much nicer to have time for a proper cuppa. You sound busy there with all the invites, good luck with them. Oh my goodness Zoe, we just finished wedding and bridal shower invitations a couple of months ago!!! My daughter is getting married in July so we are in full-on wedding mode! Sooooo much to do! Yet here I am peeking at desks! Hahaha! Can't wait to see your finished invites! You are doing really well, Zoe. Trust all comes together for the invites. Happy to see I am not the only one that stores stuff under the table! Look forward to seeing the finished invites.